Having worked for family-run restaurants his entire life, Wisconsin native Dean Laplant opened Downtown Chandler Steak House in October 2010 with the goal of bringing families and friends together over terrific food, superb wine and impeccable service. The cozy setting of the restaurant in historic downtown Chandler’s main square – a building that Dean set his sights on when he and wife, Lorie, moved from Wisconsin to Chandler more than five years ago – bringing the menu to life. Paying homage to the building’s past, Lorie, a painter, created nostalgic murals depicting scenes from Chandler’s history for the restaurant’s interior. Dean is no stranger to steak houses. His parents owned the long-running Milwaukee steak house, The Rafters, which his uncle now owns, and Dean himself started the Steakout in Wisconsin when he was just 28. 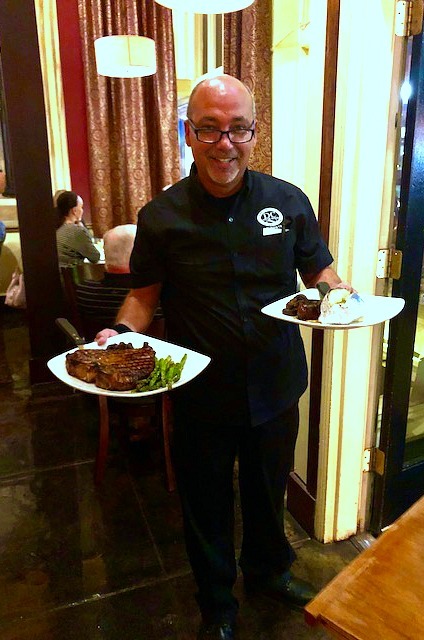 With a long history of working in his parents’ kitchen (Dean started behind the grill at 13), it’s now his honor to bring his straightforward menu of perfectly seasoned and grilled steaks, seafood and other comfort food to your table.